After a historic season that ended in the NCAA tournament, what do Seattle U women have planned as an encore? Suzy Barcomb led the Seattle U women to historic heights in 2017, with the Redhawks landing their first NCAA berth in program history. But after losing two leading scorers to graduation and another to a transfer, what can we expect from the SU women in 2018? In the quiet moments, away from the court, it’ll hit her and Suzy Barcomb reflects on what her Seattle University women’s basketball team accomplished last season. An avid gardener, she might be plunging her hands in the cold dirt when suddenly her mind races back to those deliciously, delirious three days in Las Vegas last March when the Redhawks made history. She’ll smile and allow herself a few minutes of self-congratulatory pats on the back. “I don’t do a good job of feeling the joy of it because I’m always ready for the next shoe to drop,” said Barcomb, who admittedly is modest to a fault. “I did a little better this year of reflecting back. Seven months after winning SU’s first WAC tournament title and becoming the first team in school history to play in the NCAA tournament, Barcomb still isn’t entirely certain how the Redhawks did it. “It was a whirlwind,” she said, noting SU began the conference tourney with consecutive wins that snapped a three-game losing streak. “We just weren’t playing very well and then we get to the tournament and everything clicked. Hence, the moments of reflection this summer. “I will be doing some yard work, maybe planting something — just hard labor — and sometimes it sneaks up on me,” Barcomb said. “We did that. … And that to me is more pleasurable to have it come up out of the blue that way than when other people bring it up. It’s that humility, which likely explains why the Redhawks’ WAC tournament trophy sits in her office when others might have it displayed in a more prominent high-traffic area for all to see. “When my head starts spinning and I’m overwhelmed, I look over there at it and say, ‘You’re all right,’ ” Barcomb said smiling. “As a head coach, there’s not many people who balance us out. We’re always busy balancing everybody else out. Still, she needs to brag and boast a little more. And she knows it. However, Barcomb pushed back on ideas of starting the upcoming season with a ceremony to commemorate the 2018 WAC tournament title. Barcomb is a basketball lifer and a grinder, who toiled for years at smaller schools before landing with the Redhawks in 2016. 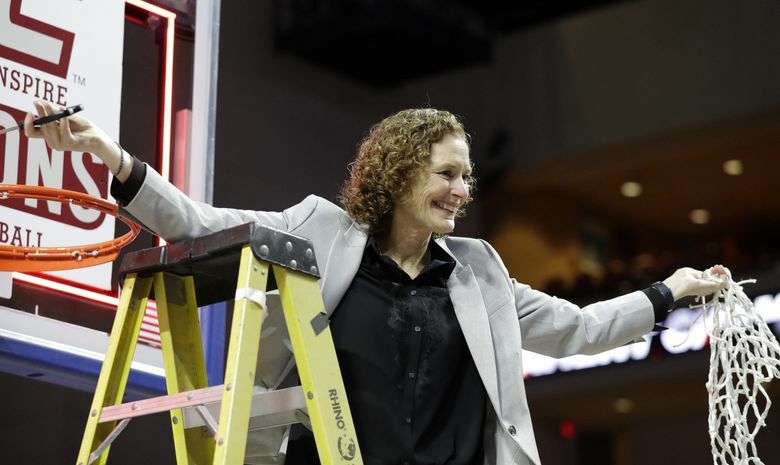 She’s one of two active NCAA head coaches to take different schools to the Division I, Division II (Cal State East Bay) and Division III (University of Puget Sound) NCAA tournaments. Her past stops will help her this season as the Redhawks, picked third in the coaches and media preseason polls, look to build upon a historic season. “It’s uncharted territory right now for Seattle U,” Barcomb said. “I’m going to have to feel my way through it. The same thing had happened at Puget Sound and East Bay. So I have that to rely upon. There’s no way I will get complacent because I don’t ever want our student-athletes to get complacent. And yet, there’s no denying the Redhawks lost a lot of firepower when leading scorers Alexis Montgomery (18.7 points per game) and Jacinta Beckley (12.3) graduated. Adding to their troubles, sophomore center Kallin Spiller, who averaged 9.2 points and 6.5 rebounds, transferred in the offseason to Columbia University. The Redhawks are expecting junior guard Kamira Sanders, who was voted to the all-WAC preseason team, to step into the void left by Montgomery, who also led the team in rebounding and assists. Sanders displayed star potential when she carried Seattle U in Las Vegas, including a game-high 20-point performance in the conference tournament championship game en route to winning the WAC tourney MVP award. The 5-foot-7 guard, who averaged 11.5 points, 5.6 rebounds, 3.4 assists, also endured bouts of inconsistency last season. “We can’t wait for half the year to go by and us to say you need to score,” Barcomb said. “It needs to be coming out of the gate. You have to understand you need to be a scoring threat for us game in and game out. The Redhawks also need senior guard Madeline Dopplick, the team’s only senior and a three-point specialist, to take on a larger role this season. Building depth in the back court became a top priority when sophomore guard McKenzi Williams, a defensive menace who played in all 33 games last season, suffered a season-ending knee injury weeks ago. And someone among a cast of unproven and inexperienced post players has to replace Spiller inside. Barcomb believes there are still heights the Redhawks can soar to, but even if SU wins on the court, she acknowledged playing in the WAC presents difficult challenges to overcome. For instance, Seattle U doesn’t have a geographical rival in the nine-team conference spread over eight states including Texas, California and Illinois. And the league tournament winner is almost always assigned a lower seed in the NCAA tournament, which virtually guarantees a first-round exit. “It’s pretty difficult to be a 15 seed and upset No. 2 on the women’s side,” Barcomb said. “On the men’s side there is more parity so you see that. Barcomb has set her sights on another first – winning an NCAA tournament or WNIT game. Correction Nov. 2, 10:45 a.m.: This story has been corrected to note that McKenzi Williams suffered a season-ending knee injury.